Festivals and fairs are the events when people get to socialize and share their feelings with each other. Fairs and festivals also help in boosting the economy of a place and the same holds true with fairs and festivals organized in Hindaun City. Hindaun City showcases the vibrant colors of Rajasthan like any other Rajasthani City or town. If you want to witness traditional customs and practices of Hindaun then you have to be part of special fairs and festivals of the city. Apart from celebrating common festivals like Dussehra, Diwali, Holi, Ganesh Chaturthi etc. special festivals like Sri Mahabirji Festival and Kaila Devi Fair have become the integral part of lifestyle of Hindaun and thereby attract people from far off places to come here and become part of these colorful events. Shri Mahabirji was the 24th Tirthankar of Jains. All the eight principles that he preached aim at better quality of life. He preached about good and bad deeds of life and how they are related to our souls. He also preached about right conduct, right knowledge and right faith. To celebrate the memory of this great saint of India, every year Shri Mahabirji Festival is held at Chandangaon, a place near Hindaun in Rajasthan. This festival attracts people from all corners of the world especially the believers of Jainism. Shri Mahabirji Festival is organized in the month of March/April during the period of Chaitra Shukla Ekadasi to Dwitya of Baisakha. The venue of this festival is the Mahavir Temple at Hindaun. The temple has an idol of Shri Mahabirji which has been found underground a hillock near a place Devta-ka-Tila. The temple has a huge marble pillar in front of it known as “Tower of Glory” or Mana Stambha. During the festival the idol of Shri Mahabirji is washed and if given many offering which include rice and yellow and white colored flowers, camphor, sandalwood, saffron, dry fruits, and mishri. 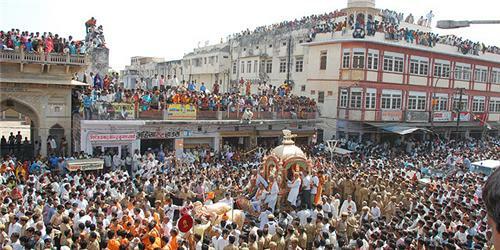 A procession or rath yatra is organized on the last day of Shri Mahabirji Fair. On the last day, the idol of Shri Mahabirji is taken to the Gambhiri River and special event “Kalash Abhishek” is held. The idol is brought in a golden chariot that is pulled by bullocks. During the procession, religious hymns are chanted and religious songs are sung. After the Kalash Abhishek Event, the idol of Shri Mahabirji is installed back in the temple. The entire temple is beautifully decorated with lights. During this festival, makeshift shops sell different types of items like household goods, toys, foods, dresses etc. The nearest railhead to reach the festival venue is the Shri Mahabirji Station, a place located only 6.5 KM away from the festival site. Ganesh Chaturthi Festival is celebrated to mark the birth of Lord Ganesha. This festival is the starting of all other Hindu festivals. On this occasion, idols of Lord Ganesha are decorated beautifully and offering like flowers, sweets, and modak etc. are given to the Lord. Local people as well as people from all the surrounding places come here to become part of this grand festival of Hindaun. Durga Ma is the main deity of Dusshera Festival. This important Hindu festial is celebrated all over India with great joy and the same happens in Hindaun. Durga Puja is a festival of four days and Dussehra falls on the last day. On this day effigies of Demon King, Ravana is burnt. Effigies of Lord Rama, Laxmana and Ma Sita are also there during the festival of Dussehra. Local people take part in various competitions that are held on this occasion. Fairs are organized where different types of shops are set up. Brij Mahotsava or Brij Festival is held in the month of March. This festival is held a couple of days before Holi, the festival of colors. The festival is dedicated to Lord Krishna. Villagers dress up colorfully and they perform songs and dances performing Raslila which depict the love story of Lord Krishna and Devi Radha. Men, women and children of all castes and creeds take part in Brij Mahotsava and even the tourists get touched deep into their heart by the vibrant spirit of Brij Festival. Apart from these festivals, Hindaun celebrates festivals like Diwali, the festival of lights in the month of October/November; Holi, the festival of colors in the month of March; Navratri, a festival that falls in the month of October and other festivals. Another important festival “Kaila Devi Festival” is also celebrated with great pomp and joy near Hindaun. It is the state festival of Karauli District in which Hindaun Tehsil/City is located. 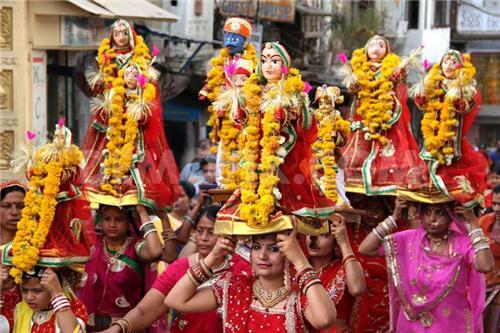 Kaila Devi Festival is a festival dedicated to Kaila Devi, Goddess of wealth. The popular name of Kaila Devi is Mahalaxmi. Kaila Devi Fair organized during the festival is considered as one of the most important festivals of the state. It is celebrated in the month of March. The festival is celebrated for 15 days. 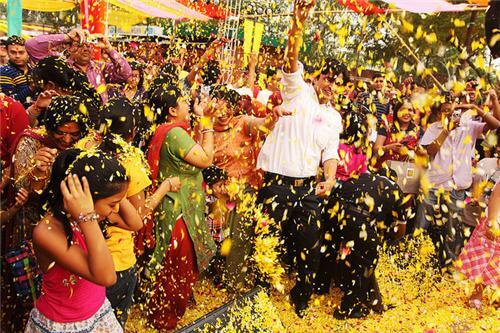 On this occasion, the deity is offered kajal, tikki , bangles, coconuts, sweets, and cash. Fair is organized around the temple premise and varieties of items are sold there. Local tribes perform traditional dances and songs on this occasion to please the Goddess.